The Young Adult Group at Christ Church Kensington is a group of energetic, fun adults in their 20s and 30s. The group gathers the second Sunday of each month for food and fellowship. The group also participates in outreach projects and a variety of church activities. For more information or to join the list serve please contact Katie Wallace (email). Bible study is offered at 4:00 Sunday afternoon, before the 5:00 service, facilitated by Lee Puricelli. Currently, we are studying the Gospels in parallel. During the Bible study we read a passage aloud, often using different translations, and discuss. While participants are welcome to review various commentaries on the readings, no preparation is necessary and drop-ins are welcome. We meet in the parish library. If you have any questions, please email the parish office or Lee Purcelli. Youth Bible Study – Youth Bible Study will be meets after the 10 o’clock service. We will are doing separate Bible study for high school and middle school youth on Sunday mornings. For more information, please contact the youth minister. Additional Bible study is offered on a periodic basis–usually seasonally. The topics vary from biblical critical studies to inspirational readings, encompassing sections of scripture such as the Gospels, Epistles or Old Testament stories. 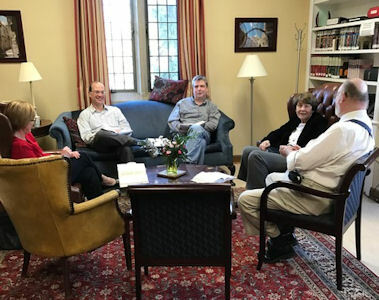 An overall review of the Bible is offered each spring in our annual Inquirers’ course, offered by the rector, for those seeking confirmation in the Episcopal church or anyone who wishes to examine or Judeo/Christian heritage. Book Discussion Groups are offered on a periodic basis.